What is the Food Like on the Mt Everest Base Camp Trek? As we were preparing for our recent trek to Mt Everest Base Camp, I was immensely curious as to what kind of food we would be eating for 12 days. Given that practically every resource needed in the villages along the trekking route has to be carried in on the backs of an insanely strong Nepali or on a yak, I was expecting bland and inedible mush. While the food was obviously no five-star dining experience, it was much more satisfying and tasty than we could have ever expected. So, what should you eat and what should you avoid in the tea houses on the Everest Base Camp trek? The following are our must haves and least favorites. You probably know that you should avoid caffeine and alcohol while trekking at high altitudes, so what does that leave for your beverage choices? Most tea houses have various fruit flavored powders that they mix with hot water. Hot lemon and hot orange were common, but hot mango was a rare treat. Hot water and sliced ginger is also usually an option, which is especially helpful if things aren’t quite right with your stomach. Generally speaking, if the tea is called “Hot [Flavor]” it is just powder, but if it is “[Flavor] Tea” it will be flavored black tea and will be caffeinated. We brought our own teas to drink on the trek, but after realizing that you still have to pay for hot water, we didn’t drink any of them. On the way down, in Namche and Lukla, we made sure to enjoy some celebratory Everest beers at inflated prices to match. Most tea houses offer a set breakfast which usually consists of toast, eggs, potatoes, and tea or coffee. It gets pretty monotonous but it’s a fairly good meal to keep you trekking for a few hours. In some tea houses you can get freshly made chapati instead of toast, which is a nice change of pace. Jam and honey are usually available, but forgo the butter- it’s always frozen and impossible to spread. Porridge is another breakfast item, but the topping options become meager as you get to higher altitudes. On one of our acclimatization days we tried the pancakes that are offered just about everywhere. They’re fluffy and over an inch thick! The chocolate variety was not so chocolatey, but the apple version with honey on top was pretty good. One final breakfast tip- if you want your eggs over easy or sunny-side up, ask for them “one side fried.” It’ll still probably be cooked the whole way through, but it is the best you can do. Sherpa stew is on nearly every menu, and each tea house has its own unique recipe. In some places it tasted like a spicy veggie curry, while in others it was more like a simple veggie stew. Our favorite was at Hotel Everest in Namche- it was full of veggies (greens, carrots, green beans) plus several kinds of beans and thin, square noodles. For lunch and dinner entrees, your best option is to carb it up with potatoes, noodles, pasta, or rice. You can add vegetables (usually carrots and cabbage), eggs, cheese, or any combination of these to your carb of choice. Everest Base Camp Trek Packing List – Did We Need All That Gear? Yep, it gets old pretty fast, but there is some evidence that consuming carbohydrates can help you acclimatize faster. For something a little different, try the rosti with eggs on top for an added protein boost. If you’re really hungry, then it’s gotta be dal baht: rice, lentil soup, curried potatoes with veggies, greens, and a papad. The best part? You can get seconds of anything you want (except the papad) for free! As we went higher up in altitude the seasonings became more bland and the variety of veggies was less and less, but it was still decent for a quick fill that lasts. As we started to descend on the trek we noticed our appetite increased dramatically (even though we hadn’t really noticed it disappearing on the way up). That can only mean one thing: we had room for dessert! In Tengboche we eyed something the table next to us ordered and found out it was a fried Mars bar. We promptly ordered one and it was seriously heaven. We never noticed it before on the menu because it’s called a “Mars roll” which we thought just meant candy bar. But no! It’s a Mars bar wrapped in a chapatti-like dough and deep fried until the inside is a chocolatey, caramely mess. You probably know that all meat has to be flown in to Lukla and then carried up (without refrigeration) to its final destination, which can sometimes take days. Therefore, it’s best to steer clear of meat on the trek. It’s also best to avoid anything on the menu that’s “western”- Jeremy got really sick after eating a pizza for lunch one day. Another menu item that was disappointing was the spring rolls. We saw someone order them in Lobuche and they were huge and filled to the brim with veggies, but when I ordered them in Namche when I was starving they were tiny and oily and lacking in the veggie department. Overall we were pleasantly surprised by the food on the Base Camp trek, especially when you consider everything is cooked using propane that’s carried up many miles by big hairy yaks. Still, the food did get pretty repetitive, and we were especially happy to get back to a wider variety of fruits and vegetables in Kathmandu. And of course, we couldn’t resist sinking our teeth into a nice juicy steak when we returned, too! For more about tea house menus, check out these menu images below from one of the lodges we stayed at! Looking to travel to Everest Base Camp but don't want to go solo with a guide? Check out a tour by Intrepid Travel to go with a group! And since this is an adventure activity, be sure to pick up travel insurance before you head out as well! I can’t say I’ve seen vegemite anywhere outside of the backpack of a few Australian friends. Maybe someone on the trail will have a jar with them! We are planning our trek to EBC in Dec16 and are busy investigating which tour operator to trek with. As a family of 4 with kids age 12&15 we are trying to stretch our budget and wonder if you can offer any advise on weather you feel it will be better value to go with a company that include all meals at the teahouses. Based on the menu you have shown and taking into account higher prices further up the mountain it appears it may be better for us to go all inclusive. Any advise you can give would be appreciated. Hi Martyn, we definitely found value in the all inclusive options. I think we ended up saving more money than others who went with cheaper packages and paid as they went, but even if we didn’t we wouldn’t have been off by much and it was quite convenient to not have to worry about it during the entire trek as virtually everything was included with a few small exceptions. It was nice to not have to worry about paying for meals and other items while on the trek so we could focus on hiking and relaxing when at the teahouses. We are going to trek to Base Camp in April and i’m so excited but weary of the food also. This post has made me feel a lot better about it so thanks for the advice!! Happy to help! I thoroughly recommend getting mini candy bars to take with you too. One or two Mars or Snickers bars a day are perfect for when you need quick sugar too! I’d say that is pretty accurate for Base Camp as well. 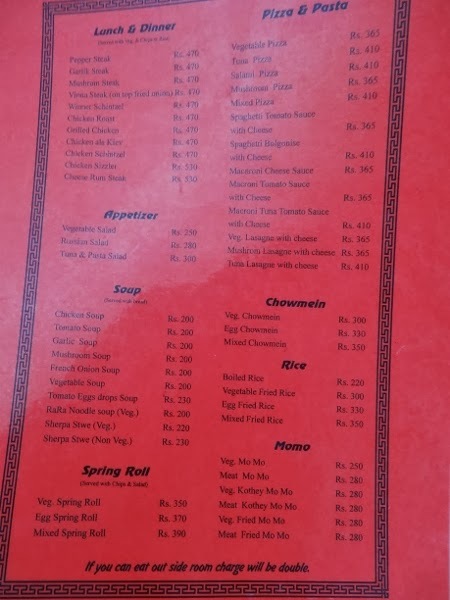 That menu was from Namche which is the 2nd lowest city out of the 8 days you trek up. It may not be exactly double, but pretty close. Some things, like candy bars and sodas, become obscenely expensive where as meals only go up by the 2x figure. Great info. This trek is something Jim and I still need to do…so we’ll tuck this info away…Do you think taking peanut butter would help? Thanks for bringing that up, we forgot to mention it in the post. Many of the tea houses have condiments available for free, oftentimes including jam, ketchup, and chili sauce. Some have also had peanut butter and soy sauce, and many, but not all, had peanut butter on the menu items that you could pay for (like for pancakes). I’m sure if you asked they’d either charge a bit or give you some for free. Hey – how much did you spend in total on food across the 12 days? Our costs were lumped into our guide price so we did not see the exact charges out of pocket. I’d imagine it would be around $200-$250 per person if I had to guess.